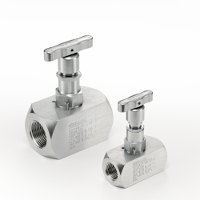 The DK-LOK® VG series needle valves are for use in general-purpose industrial applications to isolate or vent system media. The hardened stainless steel, non-rotating stem provides leak-tight shutoff and long service life. The stem threads are protected from the media by having the stem packing below the threads. The valve incorporates a compact design with a stainless steel roll pin to prevent valve bonnet separation from the body of the valve. Grafoil packing is available. This valve can also be provided for sour gas service in accordance with NACE MR-0175.